Wednesday, January 30 was Veterinary Medicine Day. About a dozen legislators joined the group for breakfast before hearing from Agriculture Commissioner Gary Black and State Veterinarian Dr. Robert Cobb. 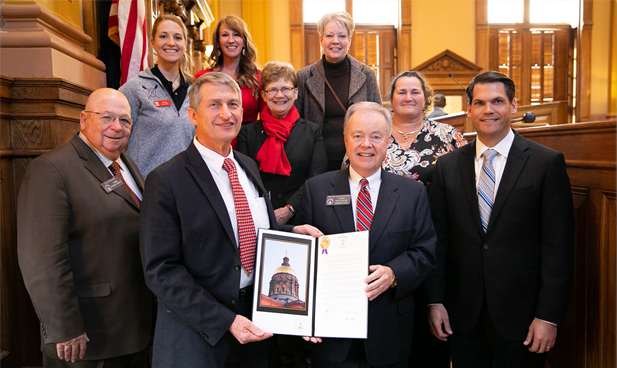 Veterinarians were also recognized in the Senate by Agriculture and Consumer Affairs Committee Chairman John Wilkinson (R-Toccoa) and presented with a copy of SR 22, declaring it to be Veterinary Medicine Day at the state capitol. Thanks to everyone who braved the chilly weather to join colleagues for a fun and informative day on the hill!